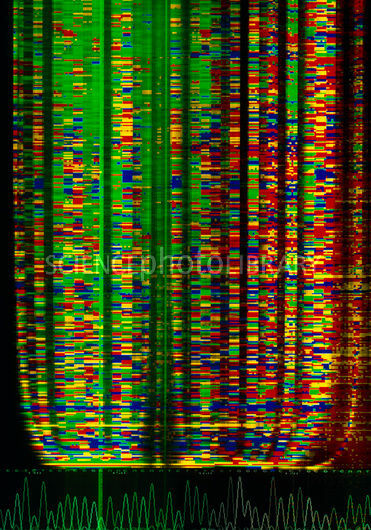 IPTC.Caption ^BGenetic sequence.^b Computer artwork of a sequenced section of DNA (^Ideoxyribonucleic acid^i) represented as a series of multicoloured bands and a graph (across bottom). DNA contains the genetic code as a sequence of four molecules known as nucleotide bases: adenine (A), cytosine (C), guanine (G) and thymine (T). DNA encodes, transmits and controls the development of the hereditary traits of living organisms.